Somewhere and at some time I vowed never to include a tofu salad sandwich recipe on my blog. I lied. Actually, it’s more accurate to say that at the time that I said that, I couldn’t foresee wanting to include such a recipe. Tofu salad. Blah. After all, one of my favorite all-time sandwiches was egg salad. Specifically my mom’s egg salad which had the exact right ration of creaminess to tanginess (we were a Hellman’s household as opposed to a Miracle Whip household). How could I expect to replicate that with tofu? Times have changed. After conquering scrambled tofu, it seemed right to explore tofu salad sandwiches. Of course, mom’s recipe was my inspiration. I highly recommend using kala namak in this recipe. Just a little of this Indian black salt (though it is pink…) gives this sandwich filling an unmistakable “eggy” taste. My mom’s classic egg salad sandwich reimagined with plant-based ingredients. Tangy, crunchy and totally satisfying. Slice the tofu block in half. For one half cut into 1/4″ slices lengthwise, then into 1/4″ pieces width-wise – so you have small cubes. Put the cubes in a large mixing bowl. Now, crumble the other half of the tofu block into the bowl. Add the remaining ingredients and stir gently to combine. 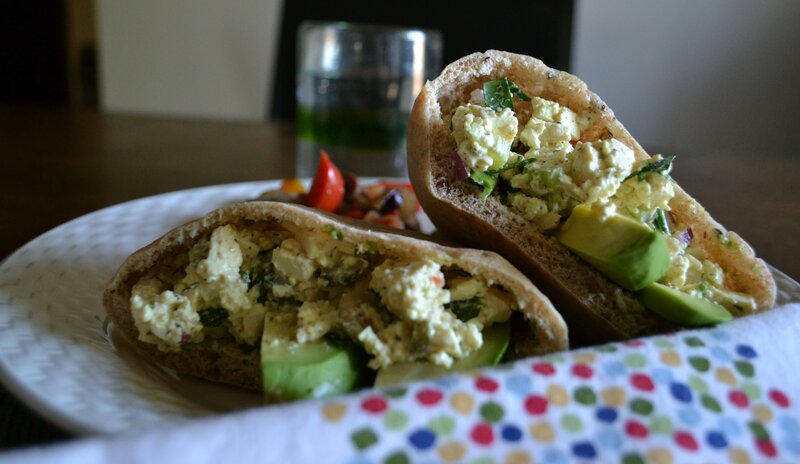 When ready to serve, slice the pitas in half and lay in with the tofu salad and toppings. Serve alongside a big scoop of Roasted Bell Pepper & Olive Salad (recipe below). The kala namak gives this salad a slightly eggy flavor, but if you don’t have some on hand, just use regular salt. A zesty roasted vegetable “salad” that cozies up beautifully with my tofu salad sandwiches. Or use it as a sandwich filling itself! Preheat the oven to 425-degrees F. In a medium-sized baking dish, combine the vegetable broth, pepper and Liquid Aminos. Add the bell peppers, onion and garlic and stir. Bake in the oven, stirring frequently, until peppers and onions are tender, 15-20 minutes. Add more vegetable broth and Liquid Aminos as needed – you want this to be a little bit juicy. Remove pan from the oven and stir in the olives, parsley and red wine vinegar. I like to serve this at room temperature. This looks amazing! I love tofu salad, and but the kind I make is pretty boring. I’ll definitly have to give yours a go next time I make some! I have a thing for condiments – especially pickled ones – so just about everything in my refrigerator that was pickled went into the mix! The Roasted Bell Pepper and Olive Salad is so beautiful! I am glad for every recipe you share and glad that when you say you’ll “never” feature a certain dish that it might not mean forever. 😀 Great timing for a Tofu Salad! Tofu salad is one of my all-time favorite staples. Have you ever tried adding dill weed into yours? It gives it an amazing zing that’s totally reminiscent of egg salad. This is gorgeous 😀 I love this kind of stuff! Thank you! I guess I still have a lot of kid in me – love sandwiches! I agree with trueindigo, what a gorgeous salad! Is tofu the vegan egg? I’ve seen it in a few recipes where I would have expected to see egg, but I’m not sure just how versatile it is. I only ever eat it as part of a stir fry, which is a bit boring of me. I should definitely investigate these other options. Yeah – tofu is so amazing! (The U.S. had an egg ad campaign that went: The Incredible Edible Egg – cuz of all the things one could do with it – and tofu is like that as well!) You can make cream sauces, puddings…as a scramble/omelet or like here – hard-boiled eggs. Even as an egg sub in baked goods. As with eggs, it’s really the seasonings and other ingredients that make tofu what it is – if that makes sense. Anyway, the resemblance to real egg salad is uncanny! How interesting, I really must find out more about this. How do you scramble it? The tofu you can get here is just a square sort of block of moist white stuff. Is that the way you get it too? Yep – a bland-looking block. To scramble, you crumble it. And it comes out looking like scrambled eggs! Add a dash of turmeric and voila! Just crumble it up without anything else in it when I cook it? When I do scrambled eggs, I whisk eggs with milk and add ground pepper, tip that into a pan and move it around until it cooks. Do I do the same sort of thing with the tofu? I’m finding it hard to imagine but I’ll need to try it. Crumble and stir in soy milk (or milk), pepper, salt – any herbs that grab your fancy. Then cook it up, letting it brown in spots if you like, but really just to heat it through. I usually add other things like mushrooms or black beans, steamed veggies. Bacon is NOT an Herb has a good, easy recipe on her sight: http://nobacon.wordpress.com/ It’s the one I used the first time. Thanks Annie, I’m going to try it. I like the addition of mushrooms, that would be lovely. Excellent! I expect a full report ;-)! Delicious! This looks simply fantastic! I just adore simple light dishes at this time of the year! Totally what I’m in the mood for as well. I love the colours in this! Growing up in a chinese family means I actually LIKE tofu. It’s funny when I hear how people have to convince themselves to like it! I’m glad you’re converted, and that really does look good enough to convert many a disbeliever! Thanks, Shu Han! If it gets my mom’s approval, I will know I’ve done well! Yes! I love condiments, and especially sweet pickles and sweet pickle relish! Nice! yummy! wow this is going on my Must make Board! Yay! Oh, I have to tell you, last night I went through my Spam list and there were a bunch of comments on there from you! I’m so sorry that they somehow got lost in the Spam shuffle. Looks like your comments are coming through just fine now. Thanks! Oh no problem, that has been happening a lot even when were signed into WordPress. Mmmm. My mom used to make the best egg salad sandwiches too, and I haven’t ventured into trying to replicate it yet. This looks so good- and I never would have thought to put roasted veggies in with it. That, with the freshly made pita- sounds heavenly. Thank you! I’m planning on making this for mom next time we’re together. Squishing ya right back, girlfriend! Now this is a tofu recipe I am excited to try! Oh I love the look of that salad! Especially with the addition of the olives. I have actualy never tried a single version of a vegetarian “___ salad” fillings, Maybe because I never liked real egg, tuna or chicken versions? But I mean, the vegan version is obviously going to be better right? 😉 I’ll have to give this a try for lunch soon! Much better, of course! Hehe! Yeah, if egg isn’t your thing (even as a carnivore)…you’re gonna avoid egg salad, right? But if you dig the other ingredients, then I’d give the tofu version a whirl. Egg salad was one of my favorites before going vegan too. This looks really yummy! I’ll have to try it out! Leave it to you to make tofu salad seem like THE only thing I want to eat! These look *insanely* good, and though I love a good egg salad (rarely) – I’m much more inclined to enjoy this! Looks FAB! Bravo! I like a good egg salad sandwich but I LOVE a good tofu salad sandwich. And this one looks great. I have never used Bragg’s, is tamari a reasonable substitute? Or is it really a whole other thing? Yep, tamari would work just fine! But give Braggs a try one day – it’s really good! Guess what I’m stuffing the pitas with next time I make them…. The tofu sandwich looks so good, very breakfast-y. This looks so good! No pittas for me at the moment – it’s Passover – but I intend to make these one of these days. Thanks! I love reworking my mom’s recipes too! I was never big on tofu until my friend recommended the breakfast wrap at Terri Vegetarian in NYC. I love your addition of the avocado. Yum. Always freaks me out how much tofu reminds me of eggs. I swear I could fool an omnivour with a tofu scramble any day. I know, I know! I so want to try it on the meat eaters in the family!